A continuing rebound from the financial crisis, combined with hope that interest rates could soon rise, sent Bank of America’s shares up by 11% last month. Shares of Bank of America (NYSE:BAC) climbed 11% in August, according to data from S&P Global Market Intelligence. That easily exceeded the broader market -- the S&P 500 was essentially flat through the month -- as well as the other banks in Bank of America's peer group, as I wrote about here. 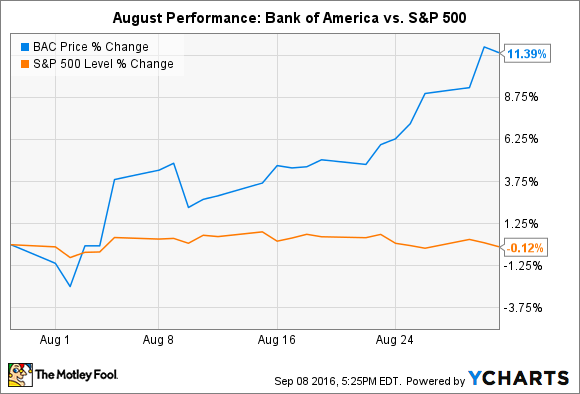 There wasn't a single, tangible event that explains Bank of America's performance in August. It was instead a combination of two, less tangible trends. In the first case, Bank of America's stock, as well as the stocks of other big banks, took a beating at the beginning of the year, as investors fretted about decelerating growth in China, the United Kingdom's threat to leave the European Union, and higher loan losses from borrowers in the energy industry who are suffering through an extended stretch of low oil and gas prices. Bank of America's rally in August can thus be interpreted in part as a recovery from this, as investors' fears of these issues abate. On top of this, as August progressed, it seemed more likely that the Federal Reserve could increase interest rates. Most recently, the president of the Federal Reserve Bank of Richmond intimated that it could happen as soon as this month. The impact on Bank of America would be substantial. In a recent interview with CNBC, Chairman and CEO Brian Moynihan said the bank's net interest income would increase by $1 billion a quarter in core earnings if rates increased by 100 basis points, or 1%. Assuming these trends continue, shareholders in Bank of America could see its stock climb further. It's currently the cheapest big bank stock in terms of valuation, trading for a 33% discount to book value. When you consider that most banks are valued at or above book value in normal times, this leaves a lot of upside for current or prospective investors in the nation's second biggest bank by assets.